While it’s been around since before the dawn of human civilization, archery is becoming quite popular again across the United States. Like any sport, you’re not going to be an expert right away. To be an expert, in fact, you’d have to spend decades training your skills, and you still might never even achieve professional status. You can, however, work extremely hard and do everything you can to improve your skills to the best of your ability. 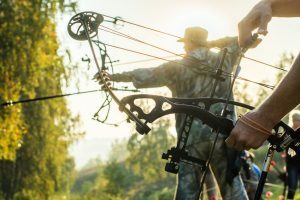 Rather than just picking up your bow and running through the woods like Rambo, you need to learn the art of the sport by attending local archery courses taught by expert instructors. These archery courses aren’t there to waste your time or hold you back; they are there to help train you to become the best shooter you can possibly be. If you aren’t concerned about the safety of yourself and others, you need to put down the bow and find a new sport — archery is not for you. Hopefully, you’re a little more levelheaded than that and you can understand the importance of safety when it comes to archery. Modern bows are powerful weapons capable of taking down a buck from great distances, and they need to be handled like the weapons they are. Be sure to ask questions during every session, be extremely careful 100% of the time, and follow all safety rules and regulations. You also need to make sure you have all the necessary equipment to succeed in the wonderful sport of archery. Talk to the pros about where to find quality bows and arrows, as well as stands, targets, and cleaning supplies. Whether you plan on taking your newfound skills to the woods or simply want to learn an exciting new skill, you need the right tools. Have fun as you maneuver your way through the world of archery. If you want to find quality archery courses, shooting ranges, or learn where to find great sporting clays here in Wisconsin, give Woodfire Lodge a call today.